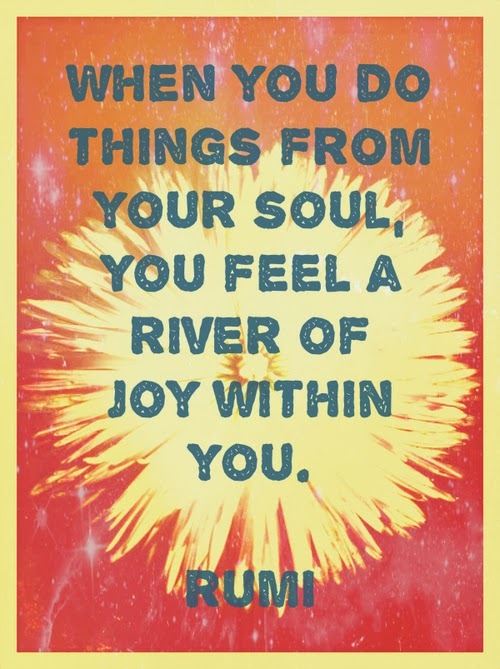 "When you do something from your soul, you feel a river moving in you, a joy." Elizabeth Lesser said, "Your soul is always sending messages. If you regularly paint or sing or write poetry or listen to uplifting music; or if you meditate and pray; or if you walk in nature, or move your body in sports or dance, you know what if feels like when you and your soul are in contact. You feel a river moving in you, a joy. You can also feel that river flowing when you reach out and help someone in need, when you are in love, when you come through the fire of a difficult endeavor, or when you finally surrender to a painful situation- when you stop fighting the far and heartache, and you give over the reins to something greater. When you tire of your won constriction and you open, come what may, to the flow of life, you and your soul become one, and you feel a river moving in you, a joy." I also found this post I wrote recently, that describes the feeling of missing that connection, and it's a poem many women have said they really relate with. I miss some of the things that make me, me. Is that accurate to say anymore? Or is it more like, I miss the things that used to make me who I used to be? I miss the arts. Things like guitar strings and writing, those were my arts. Poetry, painting, piano, those things too. I miss passing my hands through cool water in the ocean, surfing, and the sun. I miss the sand. I miss the snow. I miss sunburns. I miss napping. I miss reading. I miss shopping at Target with no time constraint. Missing these things can make me feel unhappy at times. Sometimes I wake up, and I realize everything has happened so fast, and I'm someone else so different. Sometimes I wake up, and it's kind of scary, so I fall back into oblivion. What is amazing, is how interconnected these thoughts are, even though I wrote them years and years apart. Let's all take a moment today and pay homage to the things we miss about the person we used to be, but give love for the people we have become today. Meditate on where your soul is calling you to be now, and how you can get there if you haven't already started on your way. Holiday Extravaganza with Cocoon And Others!